On Yr. Radar | Ranting About Music! Welcome back to On Yr. Radar, where we feature bands old and new with new material out now, or soon! Montreal artist Celleste might be a singer-songwriter by definition, but don’t let the categorization mislead you: there’s not a trace of sleepy adult alternative in her strutting brand of rock and roll. Built on garage rock verses and a taunting chorus under Celleste’s bratty vocals, “Superstar (By Myself)” is a fun, sneering track with more going on than you’d think–check the descending riff in the chorus, the quiet bridge, and the early-Strokes interlocking guitars on the verses. Check out her Facebook here. Never underestimate a kickass bassline. “Breaking It Up”‘s high-swinging arena rock wouldn’t have the same punch without the overdriven bassline that snakes through guitar histrionics and anguished vocals. That’s not to discredit the rest of the song, though; throughout “Breaking It Up”, Escapists stick the landing on a sound that hits hard emotionally and sonically while sounding effortlessly huge. It’s a refreshing modern rock track that’s definitely worth a listen. Stay in tune with Escapists here for more. There’s no way to get around it, this is simply my favorite cover of this song. UK eletropop duo IYES give Beyonce’s seminal hit a lush makeover without losing any of the song’s inherent charm. The drum and bass combo ground the track, giving some momentum to the dreamy keyboards and vocals that all together make for a hypnotic listen. The attention to detail here from the moody piano opening to ambient wails add to the song’s depth, and capture the feeling of being head over heels with someone while in their arms. The rest of IYES’ material is great; this is a group to watch, and you can do so here. Today’s customary On Yr. Radar acoustic punk track is courtesy of one Grey Gordon, offering up “500 Miles” from his Still At Home Here EP. “500 Miles” (no, he’s not walking them) is a wintery emo track that’s as comforting as your favorite black hoodie on a cold day, complete with lyrics to match. Every note of Gordon’s fingerpicked guitar resonates in the song’s crisp productions, and his subtly double-tracked vocals bring Ben Gibbard of Death Cab to mind. The strummed interlude provides a smart bit of structure, making the final chorus feel like coming home. Grey Gordon’s launching a tour soon, keep an eye on his Facebook for updates. “You know I’m stronger than that” is the overriding message on Ontario-by-LA singer Maggie’s new single, “Tidal Waves And Hurricanes”. Maggie’s powerhouse vocals are the main attraction, but the galloping pop-soul track behind her isn’t lacking, either. “Tidal Waves…” features a huge chorus with plenty of room for vocal gymnastics reminiscent of Adele, although Maggie’s music feels looser and less restrained (see the post chorus jam). Regardless, “Tidal Waves” is great for empowerment, singing along, and both at the same time. Keep an eye on Maggie’s website for more. Let’s spin a legacy song for a second. Rockabilly legends Reverend Horton Heat have been around since the mid-80s, and “Longest Gone Man” comes from their first demo. The song is a traditional live favorite for the Rev, and finally got put to an official LP this year (REV), and as detailed on Dangerous Minds, was a favorite of Johnny Rotten’s. It isn’t hard to see how–the song’s full of twangy rockabilly punch that sounds best coming from a convertible’s stereo, or a beat-up bar jukebox. It’s worth a listen, as is the rest of back-to-basics REV. If the rest of SKATERS’ forthcoming debut album Manhattan is anything resembling “Deadbolt”, these guys are going to be someone to watch this year. Incessantly catchy and delightfully brash, “Deadbolt” restrains itself to a low simmer during the verses before all noisy hell breaks loose on the chorus. Underneath the guitar fuzz and dead-eyed vocals, there’s a pop song hiding here, but isn’t it so much more fun to hear something fucked up like this? Manhattan comes out on February 25th, and I can’t wait to hear more. Countdown with the band on their Facebook page here. 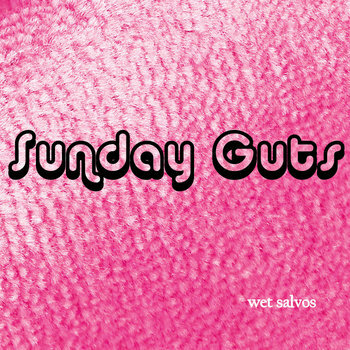 Closing today out with a bit of synth pop, care of Bethlehem, Pennsylvania group Sunday Guts, whose new three song EP Wet Salvos is available now on Bandcamp. “Truthman Who?” (from Wet Salvos) is a great song for zoning out; it’s easy to get wrapped up in the dreamy production and textured guitars, while the propulsive beat keeps everything moving forward. It’s excellent on its own, and as a part of Wet Salvos as a whole. Follow Sunday Guts’ Facebook for updates. This entry was posted in Lists, New Music and tagged Celleste, Escapists, Grey Gordon, indie, IYES, Maggie, new music, Reverend Horton Heat, Skaters, Sunday Guts. Bookmark the permalink.